The recorded webinar includes presentations from three of the workgroup members: Ken Genskow (UW-Madison/UW-Extension), Becky Larson ((UW-Madison/UW-Extension), and Mark Borchardt (USDA-Agricultural Research Service). The webinar contains approximately 45 minutes of presentations, followed by 30 minutes for questions submitted by webinar attendees through the webinar platform. Please note: The purpose of the webinar on April 14th was to provide an overview of the report and workgroup activities. A second, follow-up webinar will be scheduled for the week of May 16 to address questions people have about the report after they have had time to read it. Comments and questions for the second webinar may be submitted on and after April 14th. The second webinar addressed questions and comments regarding the Manure Irrigation Workgroup report published April 14, 2016. The workgroup was composed of scientists, public health specialists, state agency experts, farmers, and others intended to bring a diverse set of perspectives to the issue. 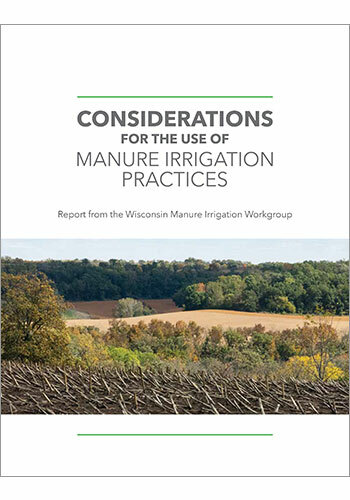 The workgroup met between July 2013 and September 2015 to explore benefits, concerns, and remaining questions associated with manure irrigation. The group had no formal authority, and its work does not establish policy on manure irrigation. 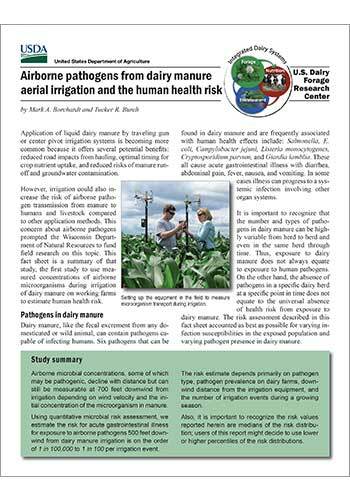 The navigation tabs at the top of the page provide more information about the workgroup activities, presentations from meetings in 2013, benefits and concerns associated with manure irrigation, additional resources, and information about how to share your comments.